FY 2018 Executive Budget advances Governor’s Middle Class Recovery Act to create jobs and infrastructure, cut middle class taxes and make education more affordable. Spending growth held below 2% for seventh consecutive year; state debt set to decline for fifth consecutive year - first time in modern history of New York. Albany, NY - January 17, 2017 - Earlier this evening, Governor Andrew M. Cuomo unveiled the proposed FY 2018 Executive Budget, which builds on the state’s fiscal discipline over the last six years while strengthening the middle class, reducing taxes, and making smart investments in New York's future. For the seventh consecutive year, the Budget is balanced and holds spending growth below two percent. State Operating Funds spending is $98.06 billion in FY 2018 – an increase of 1.9 percent. (State Operating Funds exclude Federal funds and capital). All Funds spending $152.3 billion for FY 2018. Increases Education Aid by $1 billion for a total increase of 4.1 percent, including $961 million for School Aid, bringing the new School Aid total to $25.6 billion. Increases State Medicaid spending under the growth cap (3.2 percent) to $18.3 billion. Invests $163 million to make college tuition free for middle-class families at SUNY and CUNY. Caps price of prescription drugs sold to Medicaid by state review board at no cost. Continues $20 billion investment to create and preserve 100,000 units of affordable and 6,000 units of supportive housing. Expands Buy American provisions to all procurement over $100,000, protecting our state’s manufacturing and construction sectors. Invests $2 billion over five years for the Clean Water Infrastructure Act. Supports New York’s middle-class families by doubling New York State Child and Dependent Care Tax Credit. Begins Middle Class Tax Cut for six million New Yorkers – saving households $250 on average next year and $700 annually when fully effective. Extends tax rate on millionaires – 45,000 taxpayers impacted, 50 percent non-residents. Long Island Autism Communities, Inc. Announces New Executive Director Terri Manzione, Esq. 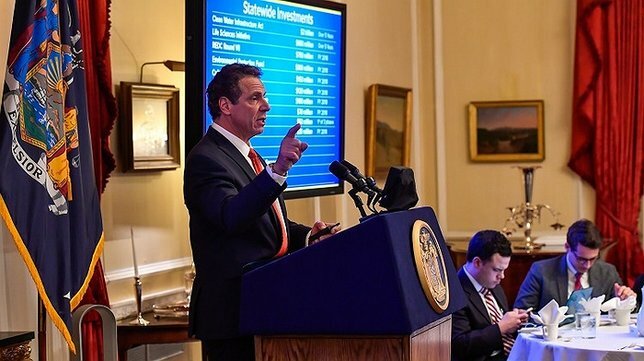 Subject: LongIsland.com - Your Name sent you Article details of "Governor Cuomo Outlines FY 2018 Executive Budget to Maintain Fiscal Responsibility, Reduce Taxes and Invest in New York's Middle Class"